Design Library palette from earlier version of DraftSight 2015 is replace by much more advanced Design Resources palette. From Design Resources palette you can drag and drop drawing contents, copy and paste them, add, attach, or insert them. You can access contents from other drawings on your computer or network places to which you are connected. You can import Blocks, Reference drawings, Layers, LineStyles, DimensionStyles, TextStyles, TableStyles, and layout Sheets into the current drawing. Where is Design Resources ? By default this palette on Left Side of DraftSight window. 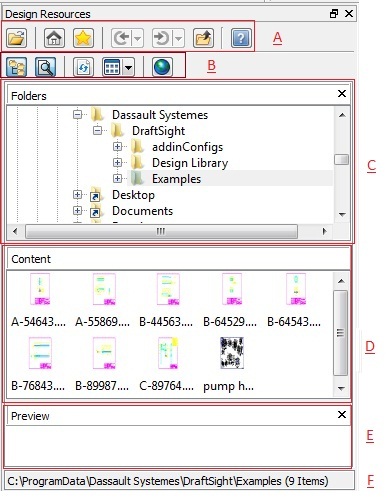 On Standard Toolbar Design resources is last tab next to Properties tab. How to use this palette? 2. Home: When you change folder locations from Folders section then you can always come back to default path by pressing Home tab. 3. Favorite: It displays favorite resources in the Favorites Folder. To add folders or files to the Favorites folder, in the Contents list, right-click an item and click Add to Favorites. Tip from DraftSight: The Favorites folder is not a physical folder on your hard drive. It is a list of links to folders and files on your system. 5. Up: This will move one level up in Folders tree hierarchy. 1. Tree View Toggle: this tab toggles and show and hide Folders Tree View. 2. Preview Toggle: This will show and Hide Preview section on Design resources palette. 4. View: This will change Content View to Thumbnails, Icons , List and Details . 5. 3D content Central: This will open link http://www.3dcontentcentral.com/ in your default browser. The Folders tree view lets you navigate to folders and files on your computer, network places you are connected to, and your system Desktop. View in Content Section can be changed to following Drop down options. 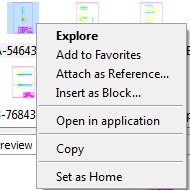 On any File in Content you can Press right click to open more options as below. F. Path: This line shows complete path name of folder.